Everyone tells you before you have a baby how much work it'll be and to make the most of your free time when you can. And it's true - your life does revolve around your little one and rightly so. But I think it's all down to the individual - your circumstances and how you handle things - as to how much time you get to be yourself as well as be a mum. It's still early days for me as Ethan is just over 10 weeks old and I'm sure when teething and crawling starts, I may feel very differently, but I wanted to write this post to let other new mums know that you WILL find time to have a shower and you WILL eventually drink a cup of hot tea again. It just takes time for you and your baby to get to know each other and settle into some kind of routine, even if it's just one based on knowing what signs to look for. There's no rush in getting out and about to mum and baby groups or starting to pick up your old hobbies again but you will find time eventually. The more you do to help yourself the easier you will find things. I'm a manic list maker and obsessively organised - I always have been and my work requires me to be - and before baby, I spent my pregnancy and even before this planning budgets and lists of what we would need, when we would need it and how much it would cost. 1. Get a mummy diary. You may think that no work means no meetings or deadlines to keep track of but actually, your little one is about to give our social diary a big boost. From midwife visits and doctors appointments to coffee with friends and baby groups, you need a diary to keep track of where you need to be and when plus important contact numbers. Keep it with you at all times and write everything down - you will get a touch of baby brain and no one can expect you to remember everything. 2. Put a shopping list pad on the wall or fridge in the kitchen so when something runs out, you can jot it down. You don't want to run out of nappies at 3am, trust me! 3. Use home delivery services for your weekly food shop. Take the time before baby is born or when baby is asleep to create and save your favourite shopping lists so if when you go there the kitchen is bare, you can get what you need straight to your door the next day. This helps you keep track of your budget and really helps you get in with the more important things as a trip to the supermarket with a newborn can really be a trial sometimes if you have a lot to get, have an unhappy baby and the shop is packed with people who have no consideration for a mum with a pram. Before Ethan was born, I created a few template lists on Asda so I could quickly reorder the essentials we use every week - this saved oodles of time and made sure we were eating well and spending within our means. It really is worth the £3 delivery charge. 4. Leave your baby changing area ready for next time. From day one, I'd always set the nursery up with nappies, nappy sacks and wipes all within reach and ready to use the next time little man needed to be changed. Even at 1am, I'd take those extra few seconds to make sure everything was ready and was always so grateful, particularly when Ethan was in a less than favourable mood. 5. Similarly, keep your changing bag well stocked. You'll need nappies, nappy sacks, wipes, sudocrem, hand sanitizer, changing mat, muslin cloth, pacifier and a change of clothes appropriate to the weather (see here for my advice on choosing or creating your own changing bag). I also have a sterilised bottle and carton of ready made milk (as I'm not breastfeeding now) prepared. Whenever you come home, replace what you used. It'll make every trip out of the house easier as you'll never have to worry that you've forgotten something. 6. Buy easy to eat food and drink for yourself. Baby cuddles are great but before you know it, you can spend the best part of the day with them in your arms and no food in your belly. Fill a two litre bottle with water and put next to the sofa for easy access and pick grab and go foods that can be eaten with one hand if needs be, such as yoghurt drinks, breakfast biscuits, dried fruit, cous cous meals etc. Or if you can find time the night before, when making dinner, make lunch for the next day so you can simply get it when you need it. 7. Invest in a slow cooker and double up portions. Slow cooking is a brilliant way to eat well but save time as everything goes into one pot and you don't need to do anything else. All you need is five minutes to put in your meat, vegetables and sauce or stock and you can then walk away, knowing hours later, a good meal is waiting for you. It's completely foolproof. 8. Streamline your skincare regime. Select the products you actually use every day and put in one bag / vanity case and keep in the bathroom. I keep most of my beauty products in the wardrobe but can't access this when Ethan is in his Moses basket so would often do without. Now, I have my wipes, cleansers, toner, moisturisers, eye cream, cotton wool and hair ties in one bag under the sink so I can make the time to look after myself. I also have a basic make up bag with the key items I use in so if I need to put my face on whilst sitting on the sofa and rocking baby in his chair with my foot, I can! 9. Multitask! When you get up in the morning, pick up all the bottles and dummies on your route downstairs and put them in your washing up bowl to soak. Grab the laundry basket, yours or baby's, put in the washing machine then put the bottles in the steriliser. Then head to the lounge and pick up anything from the night before and straighten things up so everything is back where it should be. In five baby-free minutes, you'll have a tidy house, clean bottles and clean clothes in progress so when you sit down for the morning feed, you'll feel you've achieved some sense of order and you're ready for the day. And when they nap, make the most of it by snoozing on the sofa or running from downstairs picking things up to put away upstairs then taking the bins from upstairs back down with you when you're finished. 10. Prepare bottles before you go to bed so when baby wakes in the night, you can grab a bottle whilst still half asleep and be back with them in no time. It really makes such a difference. 11. If you have an iPad, catch up on your reading or watch that TV programme you missed by having it close by during feeds. Many a time in those early days I read a book by flicking the pages on the iPad screen with my toes! 12. Put together playlists of music to either soothe or distract your baby on your phone so when they're crying, you're not wasting time trying to find something to play. 13. Take turns. Again, it sounds so obvious but you need to let your other half do things for the baby too. You both need time with and without them so trade one lie in for an hour in the bath and you'll both be able to get all the space AND all the bonding time so your baby that you need. 14. Give yourself a little goal each day. It doesn't have to be big but if you have something each day you want to do or accomplish, such as a trip out to grab a coffee, sorting out old baby clothes to give to charity or doing a fitness DVD, you'll find your day has purpose and you'll be getting things done slowly but surely. 15. Talk to other mums. Even if that's via Twitter or reading other people's blogs, you'll find this reassuring and a great way of sharing ideas and keeping in touch with the real world. I really enjoy social media and have chatted to many mums who have helped me in learning how to become mum whilst also keeping in touch with what's going on in the world. For me, being organised is being happy and a happy mummy makes for a happy baby. 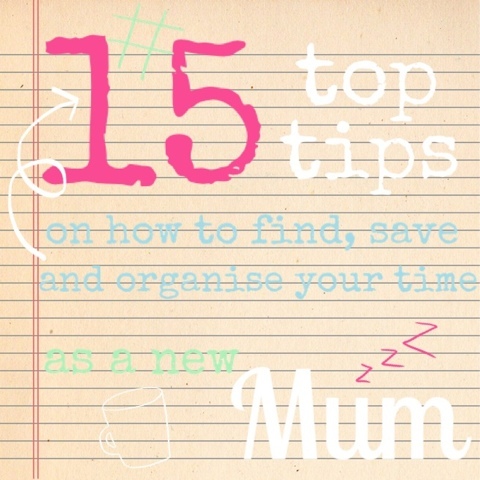 How do you find, save or organise your time?